Big Bear Weddings | Plan your Destination Weddings in Big Bear CA! If you’re getting married, you and your guests deserve the best. Why settle for subpar locations and amenities for a once in a lifetime moment? Unmatched memories call for unmatched views and atmosphere. That’s why we strongly encourage you to consider hosting your wedding in Big Bear, CA. The surrounding beauty of Big Bear Lake and the San Bernardino Mountains will surely ignite the flame that keeps your marriage shining brightly. Built in 1928, Gold Mountain Manor is an elegant, log mansion that evokes romance for even the coldest of hearts. 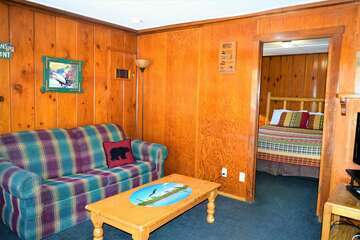 You and your guests will have run of the entire manor for your Big Bear wedding getaway. The hosts of Gold Mountain Manor want to make your wedding experience as seamless and stressful as possible. Don’t worry about leaving the manor if you should forget something – they’ve got you covered. Gold Mountain partners with vendors around town to ensure your wedding is stocked with everything you could possibly need. For the actual ceremony, you can choose between an outdoor mountain setting, accommodating up to 120 guests – or an indoor, fire and candlelit ceremony for 50 guests. The Convention Center proudly calls itself the largest mountain meeting/event facility in Southern California. 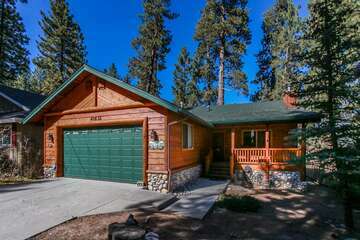 Don’t let the size scare you away – this is still an ideal location for a quaint mountain wedding in Big Bear. The convention offers full catering services, and space for up to 1,200 guests. There’s nothing keeping you from inviting the entire family – and more – for a wedding at the Convention Center. However, the facility is also equally prepared to host a small wedding for a more limited number of guests. 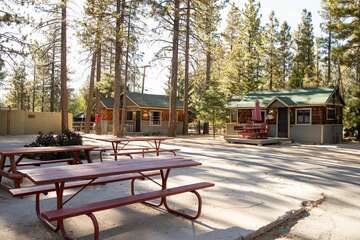 With its convenient location right off Highway 18, you’re never far from downtown Big Bear, while you can also enjoy the seclusion of the 3.8-acre facility. Marina Resort is a nice midsize venue for wedding. The beautiful, lakefront facility is ready to accommodate your ceremony for up to 250 guests. Marina works with all of their partner vendors to provide the absolute best service and accommodations for your Big Bear wedding getaway. There’s nothing quite like getting married beneath the outdoor backdrop of the majestic San Bernardino mountain range. The canopy of Marina Resort’s pavilion is the ideal setting for a wedding that checks off both categories from everybody’s marriage wish list: romance and natural beauty.